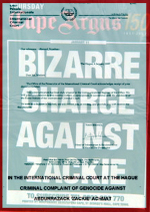 At the beginning of the year, barrister Anthony Brink and the Treatment Information Group (TIG) filed a draft bill of indictment with the International Criminal Court at the Hague, charging Zackie Achmat and his "AIDS activist" organization, TAC, with the crime of genocide against the African poor of South Africa. Predictably, the filing itself provoked a short-lived but intense feeding frenzy by the SA media as well as some of its international lackeys. Also predictably, the majority of the published reports dismissed the indictment as the ravings of a lunatic and attempted to portray Mr. Achmat as the helpless victim of a maniac with an acid pen that often blurred all the lines between even the most caustic criticism and any remnants of "good taste". A flagship in this assault was SA's "Mail & Guardian", at one time a leader in the struggle against apartheid. On February 8, Brink sent his well considered reply to some of the charges the newspaper had levelled against him in their online edition. In his words, "Arising from local press reporting of the ICC complaint, we addressed an open letter to Trevor Ncube, CEO of the M&G, entitled "Media Complicity in Genocide: the Case of the Mail&Guardian". We kept it embargoed for a week, offering more time if needed" (for his response). Although Mr. Ncube's secretary acknowledged receiving the letter, there was no further response, lest it give renewed ammunition to TIG, and so Mr. Brink has asked us to let the world know how "the lunatic" replied to his gravedigger-solemn critics. Unlike the indictment, this document has no ghoulish, theatrical overtones, all of which were quite deliberately included in the former for purposes of intentional shock and contrast. Rather it is the sober writing of a former magistrate, who knows very well how to argue in a court of law and a court of public opinion, when given the opportunity. (d) figures released in November last year to and by the United Nations, and by the South African Department of Health the year before, show that in South Africa and neighbouring Malawi ARVs are decimating the African poor. Of the country’s newspapers, on the other hand, only Die Burger reported the ICC complaint in a professional manner, and apart from a couple of minor inaccuracies properly conveyed its gravamen. Other papers contrived to ridicule and discredit it by quoting only the ironic sentencing recommendation, missing its satirical sting, and by headlining the TAC’s response: ‘rubbish from beginning to end’; ‘truly delusional’; ‘the rantings and ravings of a madman [that don’t] deserve comment’; ‘laughable’; ‘Brink had taken everything out of context … Almost every single quotation in his report was out of context.’ A news poster here in Cape Town billed the complaint as a ‘BIZARRE CHARGE AGAINST ZACKIE’. Despite timeous notification by press release, your Mail&Guardian (M&G) ignored the complaint in its Friday print edition, and more importantly failed to report the crucial facts at the heart of it. 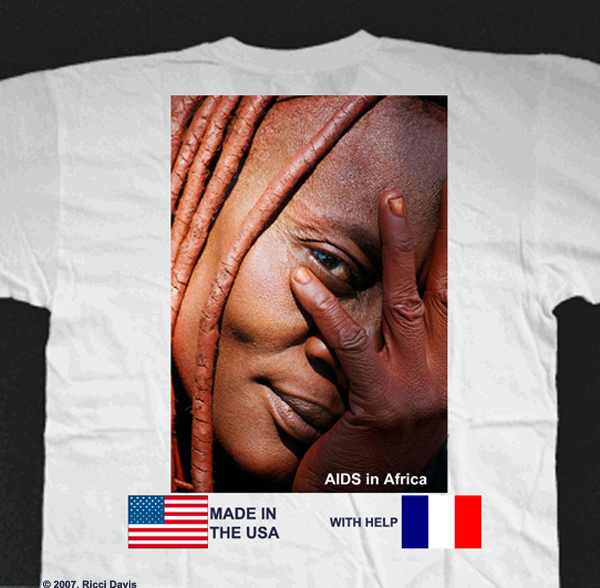 Thus were your readers kept in the dark about them, thereby perpetuating the fable that ARVs make sick Africans better, when the opposite is true." "In 1994 and again last year the prominent American AIDS treatment activist Sean Strubb (probably a good personal friend of Achmat’s) privately conceded to New York journalist Celia Farber that AZT had killed ‘a generation’ (of American homosexuals) and that her work to expose the drug, for which she’d been pitilessly vilified and abused for nearly two decades, had ‘saved countless lives’ . I protest against your M&G’s suppression of the information provided in the ICC complaint about how toxic ARVs are killing African people – critical information that could ‘save countless lives’ – and at your newspaper’s continuing complicity in Achmat’s deceptive and deadly propaganda campaign for these drugs ... which recently released reports cited in the complaint show are literally decimating ‘a generation’ of South Africans diagnosed HIV-positive, mostly black, mostly poor." The entire brief (I have no idea why lawyers call them that since they never are) can be read here. On the same website, read the scientifically nonsensical utterances spewed out by Nathan Geffen, the mouthpiece of the "Terrorize Africa Campaign" (TAC). These premeditated genocide exercises fly in the face of a German Court ruling confirming that the HIV virus has never been isolated and ergo does not exist. The word is in desperate need of a new Nuremberg trial!